The merry traveling trunk show known as the Frock Shop opens the door to its permanent home on Saturday, February 4 in perfect style. 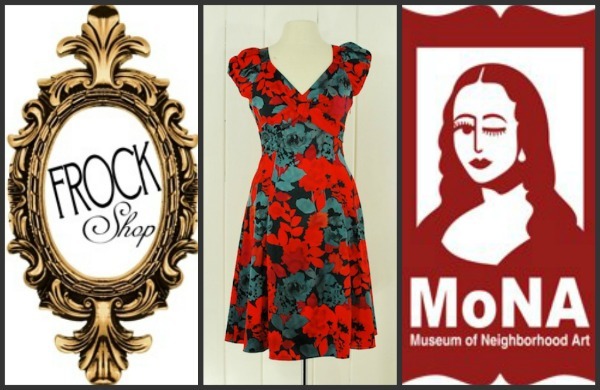 Situated at 1200 Central Avenue, the new Frock Shop Style Lounge will live in the MONA (Museum of Neighborhood Art) Building formerly known as Plaza Muse in the eclectic neighborhood of Plaza Midwood. Local lovers of independent retail can come peruse the well-curated selection of re-sale vintage, name brand and designer clothing and get first dibs on the latest collection of REVIVAL pieces, the in-house creation of Caroline Cook-Frers featuring upcycled vintage pieces re-imagined into modern one-of-a-kind styles. After frock shopping, head next door to the MONA gallery to peep some art and enjoy some wine and chocolate on the rooftop patio. For those of you who love the ‘travel’ in traveling trunk show, don’t fret. Frock Shop has plans to continue its trunk shows in various Charlotte locales as well as the Ballantyne and Lake Norman area. For all the details on grand opening celebration, head here.